The great granddaughter of two men who both became Mayor of Peterborough flew all the way from Canada to donate a family photo album for the Central Library archive. Pauline Koch (83) made the 3,500 mile trip from Toronto to hand over the Victorian, leather-bound collection featuring William Nichols and Joseph Clifton which had been passed down to her by her grandmother in 1954. Both men played a significant part in Peterborough’s history during the 19th and 20th centuries and the new collection shows newspaper clippings of the time and photos of the family through the generations. With Pauline unsure who would treasure the album in the future, the family got in touch with Central Library, in Broadway, before flying over last month. Pauline said: “We didn’t think it wise to ship the album - it was in rather fragile condition - so my husband suggested I take the album to the archives personally and, further, that my oldest daughter, Kennetha O’Heany, and her son, Callum O’Heany, accompany me, being three generations of descendants. Unlike today where the mayor serves for just a single year, Mr Nichols held the post on three occasions: 1886, 1894 and 1904. Mr Clifton was himself mayor in 1893 and his daughter, Maud Marion Clifton, married Mr Nichols’ son Francis Henry Nichols. Richard Hunt, director of culture at Vivacity, which runs the library, said: “They are two quite significant people in the history of this city. 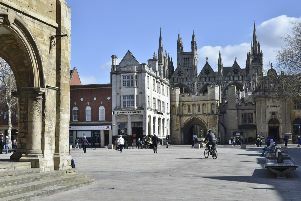 “The 19th century history of Peterborough is comparatively under-researched. We do not know as much about it as we should do. It’s a period when the city changed beyond recognition.